In its first decade, Grameen Foundation worked with a network of microfinance institutions in Africa, the Americas, Asia, and the Middle East to extend microfinance to the world’s poorest people. Grameen Foundation provided its partner organizations with financing and technical support. By 2009, the 52-member network had provided micro-loans and other services to 10.9 million people. In its second decade, Grameen Foundation broadened its approach to tackle multiple dimensions of the complex problems of poverty. Identifying solutions that build on the strengths of the poor, we put technology to work strengthening resilience and food security, increasing incomes, enhancing health, and building financial security. In 2016, Grameen Foundation and the global nonprofit Freedom From Hunger decided to join forces under the banner of Grameen Foundation. Founded in 1946 under the name of Meals for Millions, throughout its 70 years Freedom From Hunger never hesitated to embrace any change that would further its mission of ending hunger and poverty. 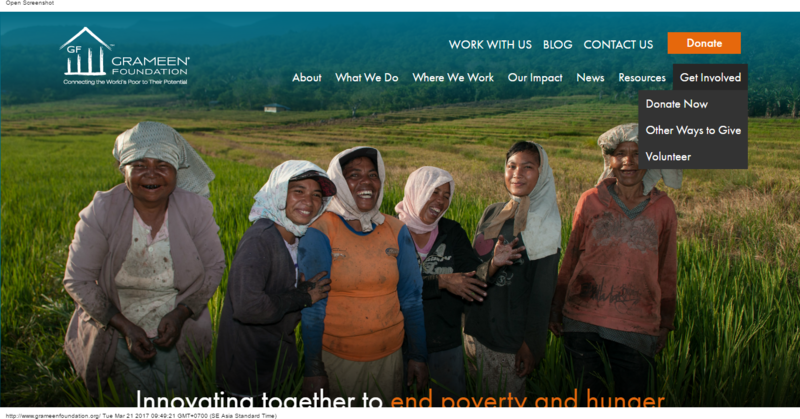 The integration of the two organizations brings together Grameen Foundation’s expertise in digital innovation to end poverty and Freedom from Hunger’s focus on providing the world’s poorest women with self-help tools to reduce hunger and poverty. Today, Grameen Foundation continues to expand and strengthen its programs, partnerships and geographic reach to enable the poor, especially women, to create a world without poverty and hunger.